Scala Storage Scale Out Clustered Storage is a scalable storage solution designed to resolve current storage requirements of unstructured data. Intended for large-scale, data-intensive, high concurrency applications, Scala Storage developed a fully POSIX-compliant parallel file system (ScalaFS) and other software components to tackle the most demanding, mission critical environments and applications. 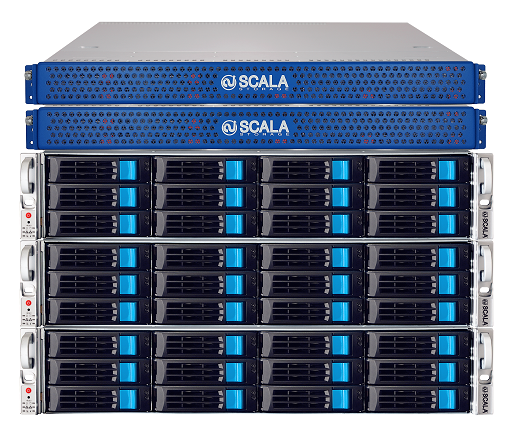 Scala Storage Scale-Out Solutions provides the best price and performance storage solution, with its pay as you grow model, predictable linear performance growth, and easy management for lower TCO. Scala Storage has proven customer successes in Internet, oil & gas, life sciences & bioinformatics, media & entertainment, video surveillance, education and government for high performance computer (HPC) storage solutions. Scala Storage Scale-Out Solutions use a minimum of 2 (up to 128) MDS depending on the number of files in the storage system. MDS stores critical information about the data store in iStore. Metadata is distributed across multiple metadata servers to provide high redundancy. Scala Storage iStore stores data and provides I/O services directly to application servers. Data is replicated and distributed across multiple iStores to maintain high availability and performance. There is a minimum of 3 iStores with no limit on the maximum amount. Network Switch provides interconnections between MetaData Controllers (MDS) and Storage Nodes (iStore). This network switch also connects to application servers performing MetaData updates and actual data transfers. Scala Storage uses an industry standard 10G interconnection, in either 10G Base-T Ethernet or SFP+ in 24 ports or 48 ports. Infiniband is also available. 783 Phillips Drive, City of Industry CA 91748 U.S.A.